The Emergency Permit is a one-year permit issued at the request of an employing school district to fill a difficult or unmet staffing need. The applicant must have a bachelor’s degree and may or may not already hold a teaching license. Basic Skills not required for permit, may be required for Pedagogy. Basic Skills not required for permit, may be required for teacher education program. The individual holding the EP must make a commitment to work toward completion of an approved program to either add the content area(s) of the EP to an existing license or to obtain an Initial Practitioner license for the content area(s). Documentation from the employing school superintendent certifying an emergency need for the applicant in the content area or areas or the school setting or settings of the request. The EP may be renewed by the school a maximum of two times if the applicant completes the renewal requirements of six semester hours as prescribed by a licensing advisor. The permit will have an issue date which coincides with the receipt date of the application. All EPs expire on June 30th. When all program requirements are met, the educator will need to apply for licensure through his/her licensing advisor who will recommend the appropriate licensing action. If the recommendation is for an initial practitioner license, the applicant must also meet the necessary testing requirements. When you apply for an original license there are 2 fees associated with the licensure: an Evaluation Fee and a License Application Fee. The initial payment will be used for the evaluation of your credentials. This fee is $35.00 (plus handling and transaction fees). After the evaluation is completed, a second payment of $35.00 (plus handling and transaction fees) will be due to issue the license. The Office of Educator Licensing will notify you when this payment is due. An Emergency Permit is issued at the request of a school district in a content area for which the district is experiencing difficulty staffing the assignment with a properly licensed educator. The Emergency Permit (EP) is a temporary credential issued to a school corporation or special education cooperative for a person who is not licensed for that assignment. The applicant must possess the minimum of a Bachelor’s degree from a regionally accredited university in order to be eligible for the EP. The individual holding the EP must make a commitment to work toward completion of an approved program to either add the content area(s) of the EP to an existing license or to obtain an initial practitioner license for the content area(s). 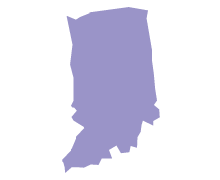 The permit holder must meet with a licensing advisor at an Indiana institution in order to learn about the requirements for completing the appropriate program. An applicant has twelve (12) weeks from the day the teaching assignment begins in the school in which the applicant is employed to apply for an EP.